The Photography Staff of Reuters was awarded the Pulitzer for Breaking News. Adres Latif. 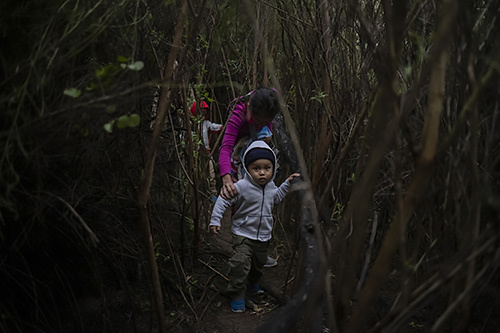 Mateo, a two-year-old migrant boy from Honduras, is led through dense brush by his mother Juana Maria after a group of two dozen families members illegally crossed the Rio Grande river into the United States from Mexico, in Fronton, Texas, Oct. 18, 2018.. The Photography Staff of Associated Press. "For searing images that chronicled clashes between Palestinians and Israelis in the Gaza Strip." Noah Berger, John Locher and Ringo H. W. Chiu of Associated Press. "For devastating images that chronicled the historic 2018 fire season in California and captured the destruction from massive blazes as they spread at an extraordinary pace." Lorenzo Tugnoli of the Washington Post won the Pulitzer for Feature Photography after it was moved by the jury from Breaking News Photography, where it was originally entered. Lorenzo Tugnoli. A woman walks past a destroyed building in the al Jahmaliya area. 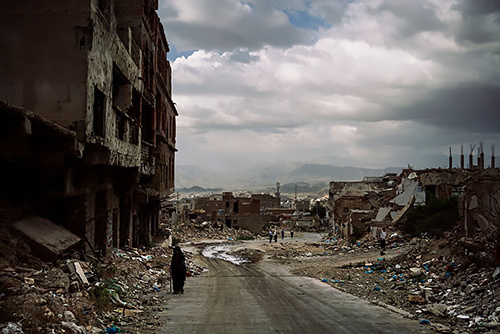 The area was heavily damaged during fighting between Houthi rebels and local militias struggling to retake the city. More recently, the area was shaken by fighting among the various militias that now control the city..
Craig F. Walker of The Boston Globe. "For superb photography and sophisticated visual storytelling that brought understanding to the story of a young boy living with a complex developmental disability." Maggie Steber and Lynn Johnson of National Geographic. "For a compelling, dignified photo narrative that provides an intimate look at the youngest face transplant recipient in the U.S."